Me with my childhood pony, Ditto. Julie and I have always shared our love of horses (and animals in general), but didn’t really have much of a relationship until she started teaching my dog and I how to show in agility. 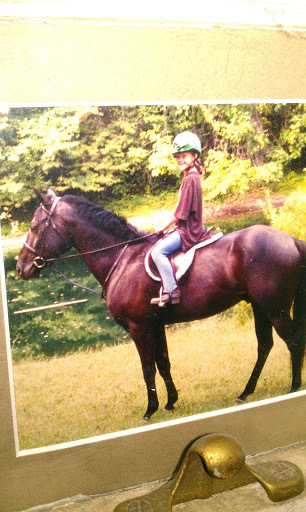 When my dog aged out and she bought a horse, I focused on high school and our relationship ebbed again. When I went to college, though, I was (re)hit hard by the horsie bug. At this point, Julie has adopted Yogi, with plans to mostly drive him (her injuries at that time were preventing her from riding much). I expressed interest in riding and she needed a jockey to train Yoge how to canter and jump, so I started riding on my breaks from school! I was rusty and so was he, but he definitely bolstered my seat with his huge trot, wild canter, and humungous over-jump. Oh, how we both improved! I believe this is from the mock CDE we won. We went to an open show sponsored by the Standardbred Pleasure Horse Organization of Ohio (SPHOOH), where I showed Yogi under saddle and acted as Julie’s groom. Though we had planned to show in cross rails, Yogi jumped HUGE jumps over the warmup ground poles, and we decided to head home for exhaustion. Overall, it was an awesome reintroduction to showing. The dressage portion of our CDE. I acted as Julie and Yogi’s groom in several more events. We competed twice in a friend’s mock CDE (Combined Driving Event), winning each year. We attempted to go to our first real CDE, but Yogi’s wild excitement makes him uneven in harness, and he appears lame when he’s nervous. We were eliminated before the marathon portion, and have put CDEs on the back-burner since then. Yogi is a very good driving horse.